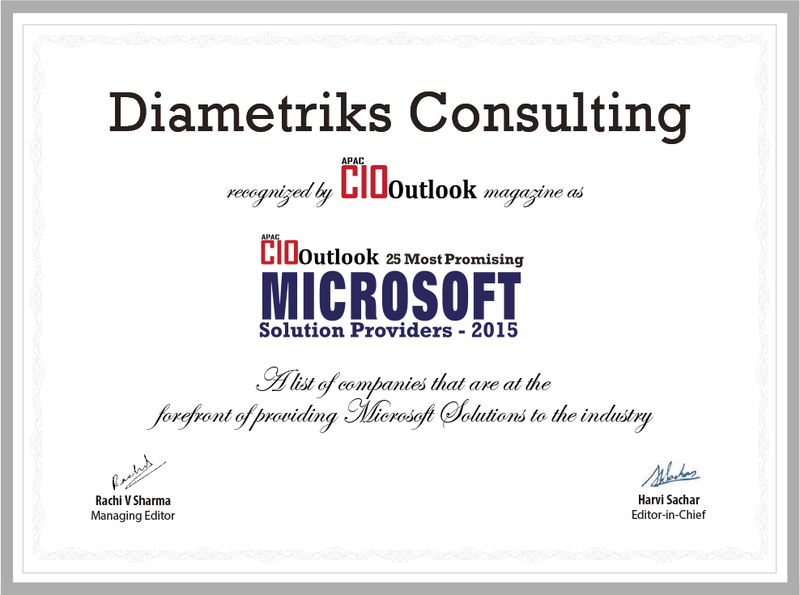 Diametriks recognized as one of the 25 Most Promising Microsoft Solutions Providers – 2015 by APAC CIOoutlook magazine. APAC CIOoutlook recognizes Diametriks as one the “25 Most Promising Microsoft Solution Providers.” Highlighting Diametriks as one of the most prominent organizations in the industry who is capable of leading its clients towards excellence by supporting them beyond an advisory level. The purpose of APAC CIOoutlook magazine is to enable organizations to find the right Microsoft solutions provider, who meets their specific requirements, and help organizations, improve customer experience and establish best-in-class solutions with the help of Microsoft’s deep domain expertise.